A single-storey furniture house at 31 Sungei Kadut Street 2, in the vicinity of Kranji, was engulfed in flames early this morning (Dec 17). 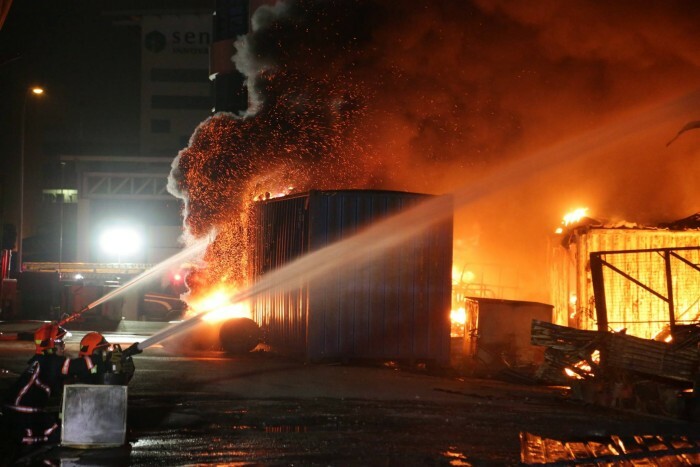 The Singapore Civil Defence Force responded to the fire at about 3am and quickly deployed resources around the premises, measuring about 100m by 80m, to fight the flames by containing the fire and preventing its spread to other buildings. A total of 25 emergency vehicles and about 90 firefighters were deployed to the scene. At the height of the operation, led by the 4th SCDF Division, 12 water jets were used to bring the fire under control. Pictures of the SCDF fighting the fire were posted on their Facebook page at 12.41pm today (Dec 17). The fire was fully extinguished after four hours. Damping down operations are ongoing. According to the SCDF, damping down is a term used to describe the application of water to wet burnt surfaces immediately after the fire is put out. It is to prevent any potential rekindle of fire from the hot burnt surfaces.